Please join us on Saturday, June 16th from 10:00am - 4:00pm for our 2nd Annual Open Studios event in collaboration with Beverly Arts Fest and Endicott College Center for the Arts. Explore the studios of fifty ceramists, painters, photographers, jewelers, musicians, printmakers, and more! Meet the artists, ask questions and purchase original works of art. A free trolley will be running all day to take you between Porter Mill and Beverly Arts Fest on Cabot Street. From 5:00pm - 7:00pm join us in the Gallery at Porter Mill for an evening celebration filled with art, food, drinks and live music by Ali Manion and Friends. 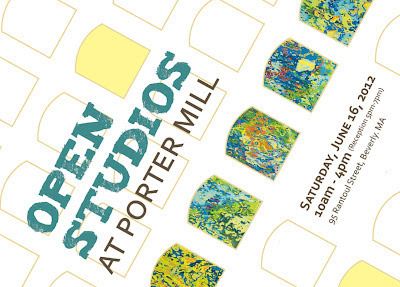 The Open Studios at Porter Mill is supported in part by a grant from the Beverly Cultural council, a local agency which is supported by the Massachusetts Cultural council, a state agency. Graphic Design by Christine O'Brien. Image detail by Lynda Schlosberg.